Close to two-thirds of Americans say they've bought something on Amazon, according to a new NPR/Marist poll. That's more than 90 percent of America's online shoppers. On that day, the residents of this downtown Washington building decided to tame the chaos. They voted that the lobby required a redesign. The boxes would get their own new package room, behind a password-activated door. This decision would reshape the building's first floor, but they bet it would raise the value of the property. At least the ungainly stacks would be safe in a separate room. In just two decades, founder and CEO Jeff Bezos has transformed from a Honda-driving online salesman of books to the world's richest man. He sits atop one of the most influential American companies at the center of an activity that makes up two-thirds of the U.S. economy: consumer spending. Close to two-thirds of Americans now say they've bought something on Amazon, according to a new NPR/Marist poll. That is 92 percent of America's online shoppers — which is to say, almost all of them. More than 40 percent say they buy something on Amazon once a month or more often. In fact, when people shop online, they're most likely to start on Amazon. "We can either go to Amazon on our own, at 9 o'clock at night, and have (our order) there in two days," said Melanie Hinchey, a mother of two who works at a tech company in Milwaukee. "Or we could wait until the weekend, and get everybody in the car, go out shopping and hopefully we find what we want." These days, it's much more than an online store. It makes movies and TV shows, has a massive cloud data-storage business where it keeps information from the government and numerous other companies, runs the Whole Foods grocery chain, offers people Internet-connected door locks, and makes the popular Alexa smart speaker. 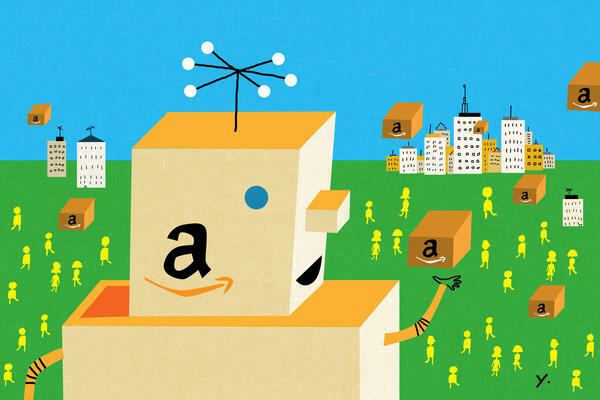 To its critics, Amazon has argued that it's actually not as dominant as it seems. "I think there's a big difference between horizontal breadth and vertical depth," Jeff Wilke, head of Amazon's consumer division, told The Wall Street Journal in October. He said Amazon accounted for less than 1 percent of worldwide retail and cited "incredible competition" in all of Amazon's different businesses. "I don't think any one of these areas is a football game where there's only one winner," Wilke said. In April, Amazon said more than 100 million people around the world pay for its Prime subscription, which in May went up to $119 from $99 a year in the U.S. The NPR/Marist poll found that among Americans, roughly 75 million online shoppers pay for Prime — plus another 35 million use someone else's account. Put together, almost two-thirds of American online shoppers are living inside the Amazon retail universe. "I buy things like soy milk and body wash and shampoo — things that are shelf-stable that I know I'm going to use every week — via Prime," Hinchey said. "They just come once a month. I don't even have to think about buying those things. It's a bit less of a mental load." This kind of shopping for basics online — batteries, toothpaste, garbage bags, cereal, canned food — is a pretty new behavioral shift. According to the NPR/Marist poll, most Americans have never shopped for basic household goods or nonperishable groceries on the Internet. But the people who have tend to buy those things on Amazon. The main draw online shoppers cite is two-day shipping. Though most retailers now offer this perk, people continue to associate it with Amazon, which all but willed this cultural change into existence. Bezos had originally appalled Wall Street when he announced what promised to be a money-losing proposition of unlimited two-day shipping to get people to pay into a yearly "membership." These days, Amazon's many tentacles have put the company in the crosshairs of competitors and critics from many directions. Privacy advocates have raised alarms about Amazon's data-gathering inside people's homes. Reports have scrutinized instances of harsh working conditions. Retailers have blamed Amazon for bankruptcies, hundreds of store closings, historic meltdowns and the death of America's malls. President Trump has emerged as a powerful detractor, criticizing Amazon's relationship with the U.S. Postal Service and Bezos' ownership of The Washington Post. There has also been talk that the president could decide that Amazon is too big and needs to be broken up. "This is one of those things where I focus on ... what we can control," Bezos said in an interview in April in response to a question about its size. "Amazon is now a large corporation, and I expect us to be scrutinized. We should be scrutinized. I think all large institutions should be scrutinized and examined. It's reasonable." "Amazon has primarily escaped antitrust scrutiny because antitrust has become so focused on consumer welfare," said Lina Khan, director of legal policy at the Open Markets Institute, a think tank. Khan, who has studied Amazon, said the government and the courts apply the laws in a way that focuses on whether companies are hurting customers. Some scholars argue that is still the right approach for Amazon as it has been for other companies historically. But in Khan's view, with Amazon, the issue is less about the short-term interests of consumers, but the suppliers, producers, retailers and competitors in all the areas where Amazon is dominant — many of whom now depend on Amazon to reach their own customers. "I think that's the other side of Amazon's power that is often neglected," Khan said. "It shows how if you are amassing market power, antitrust won't necessarily respond to that anymore, unless it's obvious that you're also hurting consumers in some way." And as far as American consumers go, Amazon's heft has not hurt the brand, which remains one of the most trusted. The NPR/Marist survey found a staggering 67 percent of American online shoppers say they have "quite a lot" or "a great deal" of trust in Amazon to protect their privacy and personal information, even though the majority of them had little to no such confidence in online retailers in general. Yet for all their love of online shopping, Americans still like their stores. When Amazon shoppers were asked whether they would prefer to shop in stores or online, a majority answered: The store. A new survey indicates just how much Amazon, the giant online retailer, has reshaped America, this nation of shoppers. Here's NPR's Alina Selyukh. ALINA SELYUKH, BYLINE: OK. Here's a big number - 92 percent. The new NPR/Marist poll found that, in America, of all the people who have ever bought anything on the internet, almost all of them - 92 percent - have bought something on Amazon. And here's a question that's been bugging me as a radio reporter - what does that sound like? What's the sound of Amazon's insane popularity? SELYUKH: One unexpected answer was in the lobby of my own apartment building, construction of a new package room specifically to tame the piles of brown cardboard boxes spilling out of the lobby closet - the sound of America physically adjusting itself to Amazon's success. But of course, the more obvious showcase of Amazon's popularity is this. How much do you shop on Amazon specifically? MELANIE HINCHEY: Gosh, it's definitely over, like, $100 a month, probably over 200 a month. SELYUKH: Melanie Hinchey is a mother of two who works in tech in Milwaukee. And she is one of a hundred million people in the world who pay for the Amazon Prime membership. In the U.S., that involves shelling out $119 a year. If you add in all the extra moochers who use other people's accounts, our poll found that, in America, nearly two-thirds of all online shoppers are living inside the Amazon retail universe. A quarter of Prime users buy something every week. HINCHEY: I buy things like soy milk and body wash, things that are shelf stable that I know I'm going to use every week via Prime. And they just come once a month. I don't even have to think about buying those things. SELYUKH: This kind of stocking up on the basics online - like toothpaste, garbage bags, cereal, canned foods - it's a powerful shift in behavior that we're just starting to see. According to our survey, most Americans have never done this. They've never bought basic household or nonperishable goods online. But the people who do, like Hinchey, tend to rely on Amazon. Convenience is habit-forming, and it's something founder and CEO Jeff Bezos knew early on. Here's what he told NPR in 1999. JEFF BEZOS: Our No. 1 mission is to be Earth's most customer-centric company. And we mean that across any industry and across any time. SELYUKH: This obsession with customers has catapulted Amazon into a company worth $800 billion today. It's made Bezos the richest man in the world. Amazon now employs more than half a million workers. And we should note - the company is one of NPR's underwriters. Amazon is now making movies and TV shows, storing government data on the cloud, selling internet-connected door locks, making the popular Alexa smart speaker. When a company gets to be this far-reaching, critics emerge from all directions. And for Amazon, the most prominent one is President Trump. Bezos was asked about this by the head of a media company called Axel Springer in April. The question was, what if Trump decided that Amazon was too big and should be broken up? Here's Bezos. BEZOS: For me - again, this is one of those things where I focus on what we can control. And I expect, whether it's, you know, the current U.S. administration or any other government agency anywhere in the world, Amazon is now a large corporation. And I expect us to be scrutinized. SELYUKH: But what the scrutiny entails is unclear. Legal scholar Lina Khan has been studying the power and impact of Amazon. She says that the government and the courts apply the laws in a way that makes it difficult to check Amazon's dominance. LINA KHAN: Antitrust laws have become very focused on consumer welfare. SELYUKH: She's saying the laws focus on making sure that consumers have enough choices or don't get overcharged, for example. But with Amazon, Khan argues the issue is not the short-term interest of shoppers but the impact on the suppliers and the retailers and the competitors in all the areas where Amazon looms large. Many of them now depend on Amazon to reach their own customers. KHAN: And it shows how if you are amassing market power, antitrusts won't necessarily respond to that anymore unless it's obvious that you're also hurting consumers in some way. SELYUKH: Khan has her own critics. But that's the thing about Amazon. It reaches far and wide, but customers trust it - a lot. In our survey, a majority of online shoppers said they don't have confidence in most online retailers when it comes to protecting their privacy, but 2 out of 3 said they do trust Amazon. And that's a big reason why Americans are OK with Amazon's reign as the top online retailer and brown boxes keep piling up in my building and on doorsteps across the country. (SOUNDBITE OF J'SAN'S "GROOVY LIFE") Transcript provided by NPR, Copyright NPR.